Here’s our FPL team tips GW16 article where the 1st group of the FFGeek contributors show their teams for GW16. In this part there’s Joseph Crilley, Alex Ball, Rob Reid, Jordan Sadler, Yaniv Salomon and Mikael Danielsen. Apologies for the short nature of the write up this gameweek, but Christmas social season has rather taken over! A very strong performance from my team last time out led by captain Kane gave me a sub 100k gameweek rank which meant I got a nice boost in the overall standings. The aforementioned socials did result in unexpected Thursday night transfers, though fortunately it wasn’t anything too shocking! 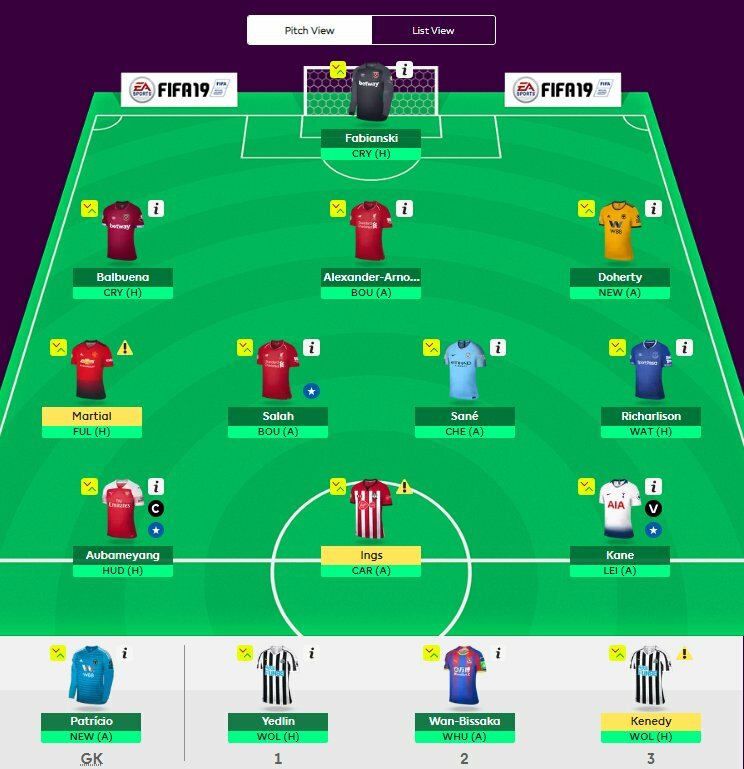 I’ve succumbed to the crowd and brought in Aubameyang for his promising fixture against Huddersfield this week. Salah and Kamara are the pair to leave my team with Camarasa filling the bench fodder role following Warnock’s statement that he will now be on penalties for Cardiff. Aubameyang takes the armband on his debut so hopefully he bags a nice return! After a few weeks of torture and torment, my team finally caught a break and a welcome green arrow arrived. It’s nice after a tough run to reflect on a successful gameweek and it looks like some of the risks I’ve taken over the last few weeks in reshaping my side are starting to ultimately help me. I’ve commented on this before, but if you return in the first few minutes of the gameweek then you often get the feeling that you’re on for a good one. And it was Ryan Fraser who did just that, with an assist early in the Huddersfield game followed by a tidy finish 15 minutes later for his first league goal since September. Glenn Murray followed this up 10 minutes or so later with a penalty before coming off injured though he still managed a couple of bonus points. Despite my -4, Stones missing out on a clean sheet and Arnie’s injury, I ended Tuesday having jumped 40k in the rankings and was looking forward, if a touch apprehensive going into Wednesday. 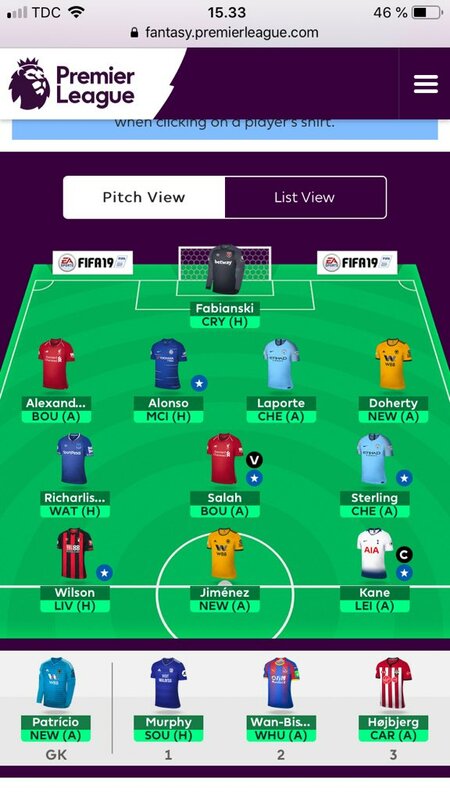 Would I be stung by not captaining Salah? I had a little wry smile when I saw the Wednesday team sheets and the resulting fallout on Twitter. After the ignominy of the previous gameweek’s team news it was nice to see things go in my favour. VVD a solid starter among a much changed Liverpool defence and the decision to captain Kane vindicated by Salah’s surprise benching. I wasn’t bothered that the late minus 4 I’d taken on Tuesday as a buffer to cover any defensive rotation wasn’t needed, as ultimately I’m happy it’s made my squad stronger in the long term. The night progressed well in the end. Richarlison scored, Salah chipped in an assist off the bench, Kane’s captain haul was a lovely boon and there was another surprise assist from my current MVP, Mr Virgil Van Dijk. 2 assists in 4 days – what is going on?! So while last week was about being saved by the defence, GW15 was the first gameweek where every team scored in 8 years meaning that it was all about the midfield and attack. Overall, my core players generally did well and I had a return from one of my differentials – 5 returns out of 7 is something I’d be happy with in any gameweek. 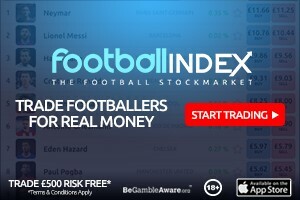 By the FFG metrics of an overall rank inside a million and minimum 5 returns it was certainly a success. Hopefully my team can carry this form forward into GW16. John Stones – gametime a concern still, some decent replacements at this price-point. Staying fluid on this one. Mo Salah – not getting big enough returns still for £13m. GW17 a possible exit point. I’d like a second City midfielder as my Salah replacement. So my transfer options are Salah and Arnie out then either Sterling or Laca in or Auba and Sane in. I like both moves, but I prefer the fact that the second move leaves me some cash spare. Slight worry this week that Auba may have his minutes managed, but I’m looking longer term with this move and I think he’ll prove better over the next 6 weeks. Next week my plan will then be to sell Glenn Murray and I’ll then look at the rest of my Naughty Boy list the week after provided no other problems appear (which they inevitably will.) So to confirm, I’ve sold Arnie and Salah and brought in Aubameyang and Sane for a minus 4. I did this on Thursday to catch price rises for them both. I’ve some dilemmas in team selection this week with Chelsea playing City and Bournemouth playing Liverpool, I think this will limit my score somewhat. At present I’ve left Alonso on the bench as first sub though I suspect he’ll come in for either Murray or Stones. Masuaku (who actually got an assist in midweek though I’d benched him) will be second sub and AWB will be my last resort. Captaincy is on Aubameyang who is doing well in the polls this week. It was a much better Gameweek this week: I got a nice score of 65 with 6 of my players returning including my captain who was my highest scoring player. Fabianski scored 9 after saving a penalty and it could have been even more but he unfortunately lost his clean sheet in 95th minute. None of my defenders returned unfortunately bar Doherty who was on the bench. All my midfielders returned, even Salah who only played 25 minutes (fortunately for me I switched my captain to Kane after seeing the polls). Richarlison scored 10, Martial and Sane both scored 7 and then Salah scored 4. Arnautovic unfortunately came off injured in 39th minute after already picking up a yellow card so scored me 0. However, Kane made up for both of them with a nice score of 12, doubled to 24 as he was my captain. All in all a very good week and a nice green arrow back into the top 2.5k. So option 1) I considered 5 different players: Jimenez, Wilson, Zaha, Mitrovic and Rondon. The first 3 I disregarded due to what I view as poor fixtures for them. Wilson in my opinion is the only fixture proof one of them 3 and even so I think there are better alternatives right now when he has 4 tough games in his next 5. Mitrovic was great at the start of the year but I want to see more of Ranieri’s Fulham before seriously considering him as I’m not sure if he’ll flourish or flop under Ranieri so we shall see. Finally for Rondon, I already have Kenedy from Newcastle so doubling up isn’t smart in my opinion so that rules him and option 1 out. For the other three options I put a poll out on twitter to which a couple of hundred of you voted so thank you for that. Option 2) was a straight swap to Hernandez but my main concern with him is game time as I’m really not sure what Pellegrini is planning on doing now Arnautovic is out. 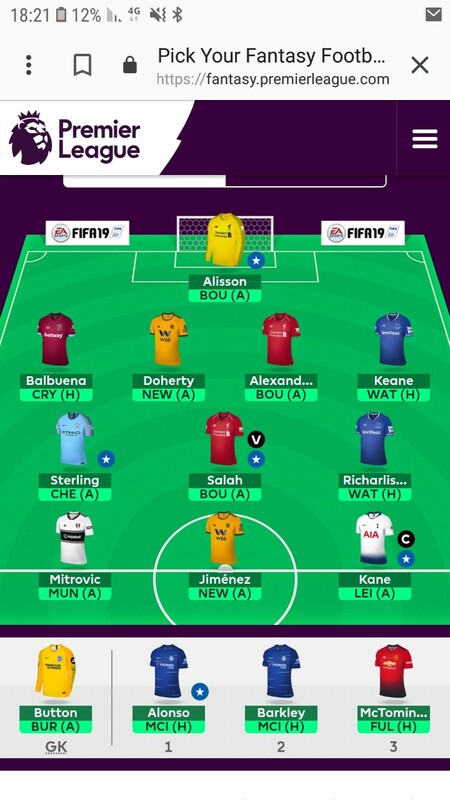 Option 3) was a hit where I transferred Alonso to Yedlin and of course Arnautovic to Lacazette but a concern for me in this was whether Lacazette will even start and whether he will actually even be a viable alternative to Aubameyang over these next few games. Finally, option 4) was a -8 where I transferred Alonso and Laporte to Yedlin and Balbuena and then Arnautovic to Aubameyang. The concern for this option is it’s a -8 and similar to Lacazette, it’s hard to know if he will start as he could easily be rotated with Lacazette this weekend. to have reduced now as well. Laporte I don’t really want to get rid of but he doesn’t really ever score over 7 unlike Mendy so I think losing him wouldn’t be a huge deal, especially for someone with god fixtures like Balbuena. After a lot of thought and looking at the poll I decided to go risky and go for the -8. Hernandez got 27% on the poll, Lacazette (-4) got 33% on the poll and Aubameyang (-8) got 40% on the poll so it was the most popular pick as well which is good to see. So my transfer was Arnautovic + Alonso + Laporte > Aubameyang + Yedlin + Balbuena. 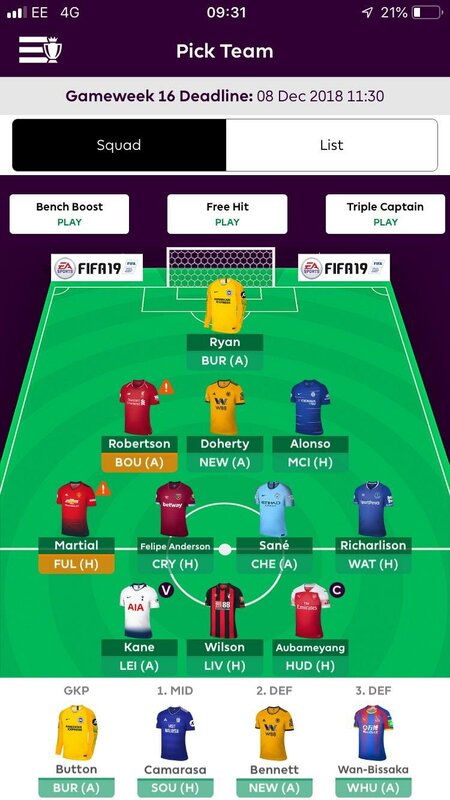 Bench decisions this week were a bit tricky. Now that all my defenders are budget bar Alexander-Arnold it’s all about putting the best fixtures in. Doherty has Newcastle away, Yedlin has Wolves at home, Balbuena has Palace at home and Wan-Bissaka has West Ham away. Right now I have Yedlin as my first sub, Wan-Bissaka as my second and Kenedy as my third but I may switch Balbuena and Yedlin around, we shall see. In regards to my goalkeepers I’ve gone with Fabianski over Patricio this week as I think Fabianski’s fixture is better and Fabianski is far more prone to save points. With me bringing Aubameyang in and him winning the geek polls with 40% to Kane’s 30% I think I will be captaining him over Kane as Leicester away really isn’t a great captaincy fixture in my opinion. The concern is Aubameyang’s game time but he always seems to get good time off the bench anyway even if he doesn’t start and the only 2 times he hasn’t started this season he scored 4 and assisted 1 in those 57 minutes off the bench so that seems promising! Good luck with Gameweek 16. 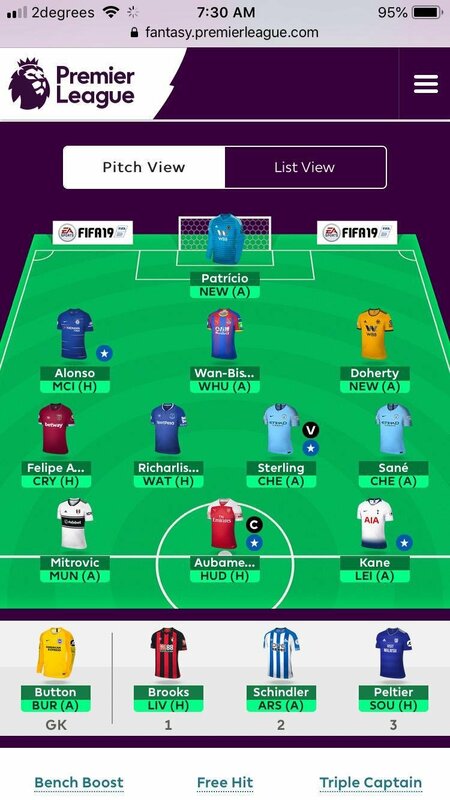 Going back to my roots, Mitro for Arnie, Kane captain again, no Auba , I cross my fingers about it..